The DVI?2500HD uses 4 strand fiber optic cables to extend Dual Link DVI display up to 6,600 feet away from your source. Dual link DVI describes the use of all 24 pins of the DVI (Digital Visual Interface) connector to achieve super high resolutions. 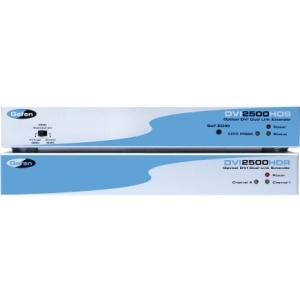 Featuring Virtual DDC, the DVI?2500HD can run without the use of a CAT5 cable.